The Project Management Methodology or PM² is the project management methodology promoted by the European Commission of which I spoke to you some time ago in this article All about the Open PM² Methodology for European Community Project Management. Today we are going to deal with a very powerful tool for communication with stakeholders of a project, both with the team and with people outside it, is the PM² Canvas. It can be downloaded from this address Project Canvas. The tool allows us to have in a single page (can be A3 size) all the important information of our project. Once completed, we can print it and hang it in the room where the team works so that everyone can see it and consult it whenever they need it. On the other hand, we can electronically share it with the rest of the stakeholders of the project so that everyone can have the information and review it. It is only 1 page so we avoid the rejection of a document with multiple pages that just open it seems to invite us not to read it. Being a canvas allows us some very interesting dynamics in addition to those discussed above. In the early stages of the project, we can practically use it as inception of our project, that is to say as a tool to discover each one of the elements of the canvas for our project. We can also use it as the Team Canvas that we recently revised, as the team, working together, is inclined to have conversations that clarify the doubts of the project and to create beneficial team ties when the development of the project begins. Well let’s see a little more in detail the components of the PM² Canvas. The canvas of the project established by PM² allows us to define on a sheet of paper the following data of our project as a summary so that we can consult them and show them to anyone at any time. Assumptions and constraints. The assumptions we’ve made and the constraints we’ll have to face. Outputs/Deliverables. The deliverables or outputs that will result from the project work, as well as the tasks and activities necessary to achieve them. Desired Outcomes. The main project objectives and metrics to measure success are listed. Benefits. It shows the value proposition and the benefits for users that will be achieved at the end of the project, taking care that the benefits are measurable. Critical Success criteria. They are measurements to determine that the established objectives have been reached by the project and that it has fulfilled its requirements. Critical Success factors. These are the critical factors for the success of the project. The team should focus on them to achieve the project objective. They are different from the above. Stakeholders. How not to have a list of stakeholders in a summary of a project. We list them with their name, title and role in the project. PM² Handbook. In a simple way it would be how we are going to adapt the methodology to the reality of our project. We describe if we are going to need an outsourcing plan, a transition plan, etc. Governance and Team. We describe each of the roles involved in the project and our project team. Risks. If at this point I have to explain to you what a risk is and its importance to Project Management uhmmmmm… there’s a lot left for you to learn, little grasshopper. It includes a list of the main risks for the project and an evaluation of them with a Probability / Impact matrix. Values are estimated qualitatively with values from 1 to 5. Milestone Schedule. At a high level we define the main milestones of the project. 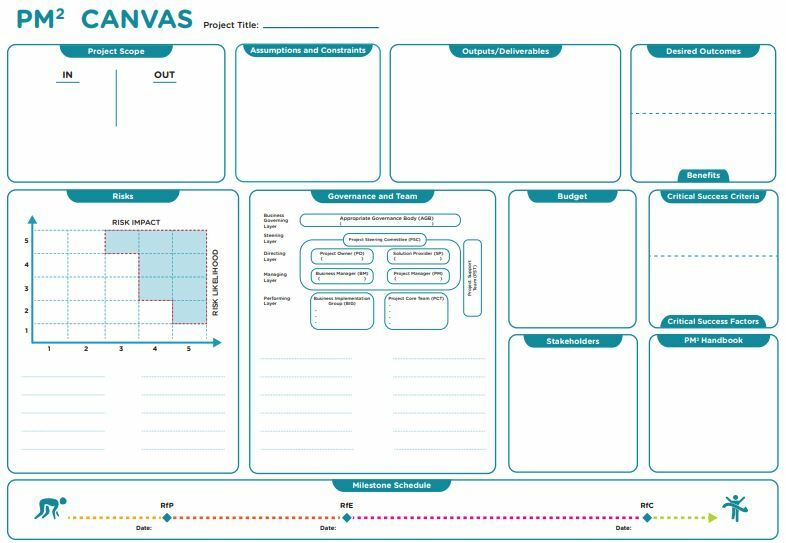 With this you have enough to get down to work and try the PM² Canvas in your own project and get the benefits for the success of it.